Go Rhino BR20 rear bumper is crafted from 3/16 inch thick steel, this tough truck accessory is completed with a one-piece welded design for superior strength. So you can ensure your ride is ready for any terrain you're looking to take. Go Rhino BR20 rear bumper come equipped with one inch intergraded D-rings, so you never have to drill into your bumper. Your rear BR20 bumper also includes additional rear light cut-outs and back-up sensor mounting locations for increased visibility in even the stickiest situations. 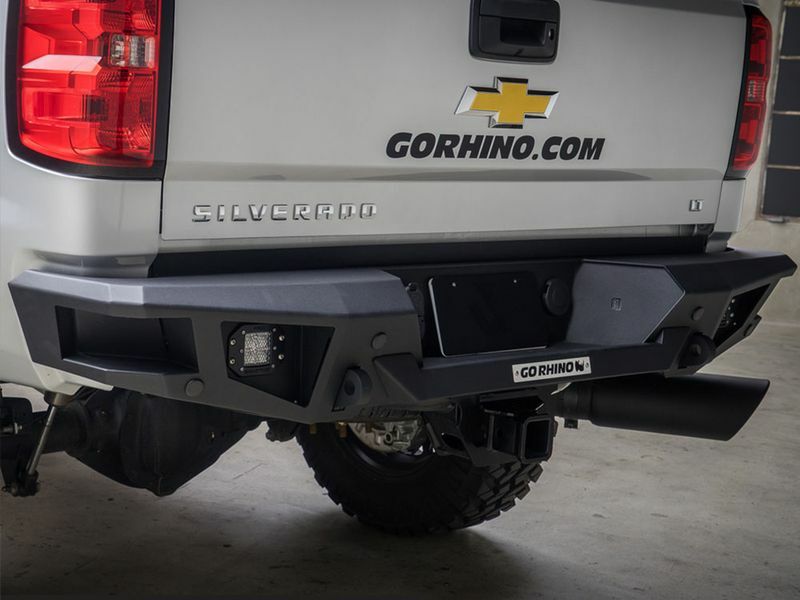 The Go Rhino heavy duty rear bumper has a textured black powder-coat finish. Go Rhino makes installing the BR20 rear bumper very easy, without drilling or cutting on your truck. We would recommend that you do have a buddy help you install the Go Rhino BR20 due to the weight of the rear bumper. Go Rhino Bumpers are backed by a five year structural and finish warranty. So if you are looking for a stylish new look, then the Go Rhino BR20 rear bumper is the ultimate way to add rugged good looks and versatility to your truck. Also ordering the BR10 front bumper with the BR20 rear will make your truck look complete. So what are you waiting get your BR20 heavy duty rear bumper orders today! Go Rhino offers a five year warranty on all their replacement bumpers against defects in materials and workmanship, including finish. The Go Rhino BR20 rear bumper can be installed fairly easily at home without any drilling or cutting. These replacement bumpers bolt right up to the frame of your truck, however I would recommend that you have a buddy help you install due to the weight of this bumper. If you have any other concerns or questions please give us a call at 877-216-5446.